The Monday strength may have a little something to do the the $0.50 quarterly payment, up from 45 cents. There's something deeply satisfying about a Whopper with cheese from Burger King. I don't know exactly what it is, but as I age, eating stuff like that less often has been a sacrifice. Not to mention just how good Popeye's Louisiana Kitchen happens to be, or Tim Horton's coffee. Did you ever have Tim Horton's? Tim Horton's is not very commonplace in New York, but wow, you might not go back to whatever coffee you drank prior to trying this once you get there. 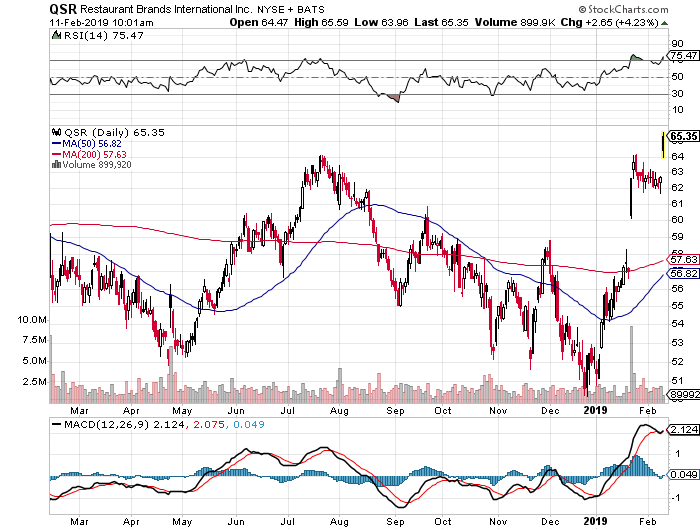 Those are my personal reviews for the brands operated by parent Restaurant Brands International (QSR . Equity markets are favorably reviewing a Monday morning quarterly earnings release right now as well. Restaurant Brands reported fiscal Q4 revenue of $1.39 billion, which was in line with expectations. These sales led to earnings per share of $0.68, which beat expectations by a penny. The real news for this stock came in mid-January when the firm shook up the executive line-up, moving Daniel Schwartz from CEO to Executive Chair, and Jose Cil from president of the Burger King unit to CEO. Oh, by the way, the shares roared significantly higher on huge trading volume at that time, and had largely held that level until moving higher again this morning. Comparable sales were good but pedestrian in growth in my opinion. Then again there is a new enthusiasm around the new leadership model. There is a feeling that Cil can move the firm toward a greater global presence. Oh, and they increased the dividend too. The Monday strength may have a little something to do the the $0.50 quarterly payment, up from 45 cents. That brings forward looking yield up to 3.19%. Is this morning's move the start of a cup with handle breakout of a six month pattern? Could be. If so the stock could reach the high $70's. The dividend increase does likely help that along. My idea is that a trader interested in owning 100 shares of QSR could then turn around and sell a July $75 call against the position for about $1.18. An aggressive trader could also sell a July $55 put for a rough $1.23. What this will do is reduce that trader's net basis by $2.43, while forcing the trader to take a profit at $75 should the shares get there by summer. This set-up also exposes the trader to increased equity risk should the share fall below $55 by that expiration date. At the time of publication, Stephen Guilfoyle had no position in the securities mentioned.